I am facin a funny problem. Remote is Panasonic Air Conditioner. result of Temprature up and down is same as last result, i.e. 'result' is not altered. Any button in timer section a has no result. Hey this was really helpful. Thank You. I am new to Arduino and I am making an IR interface between two Arduinos. I want to send Hex codes between the two boards, which can be later read on the serial moniter. Can you help me please? Which output pin does the IR led need to be connected to on the Arduino Due? First of all, awesome library Shirriff. Thanks its tremendously helpful. Great work on your recent IBM 1401 mainframe bitcoin miner too. Pretty neat stuff. I've been working on a 'serial interface remote' project and had a weird issue- looked through the blog, didn't see any similar issues so I thought I'd bring it up in case someone has similar problems. Maybe it's just an oversight on my part, but idk, here it is anyway. IR Reciever and IRrecord sketches capture the "power on/off" button code from my Epson H562A Projector as NEC: C1AA09F6, 32 bit. I have no problem transmitting NEC protocols to other devices so I know my syntax and conventions are correct, but playback or irSend.NEC() fail to power on the device! I tried the IRrecvDump sketch and an irSend.sendRaw() with the resulting codes, but no dice! (I'm confident with my syntax there too). Then I decided to transmit the code from my android device instead of the Epson remote and see what happened. What do you know!? It recorded the ir burst as a raw instead of a NEC! I plugged in the recorded data into the irSend.sendRaw() method and viola! Worked like a charm. I'm loving this library but having some trouble using the RAW codes. I need to send commands to and Audiovox portable DVD player so (I believe) RAW is the only way to go for me. As I understand it if even one of those is off (sometimes a 500 will be 550) then I'll get a false and can't trip my code. My problem is I do not have the original IR remote. An old Universal IR remote I had ( Lost it too !! ); has a SETUP key that you keep pressing until the device under test is switched off or on This way that little remote DISCOVERED the protocol used by the device under test. Can one emulate such function and let LIRC spell out the unknown IR protocol then build a file for it. Am I pushing my luck here ??? I use this library too Ken. Thanks a lot! But I have a question. I used NEC protocol for my LG television. And I already record it. But when I tried to send the code again, I need to repeat it from 2 - 8 times to get the same code from the remote. Do you know what's wrong with my project? Looks like version 1.6.0 includes a library called "RobotIRremote" which includes IRremote.cpp and IRremote.h, and this appears to be stopping my projects from compiling. I've tried switching the Board to Leonardo or Yun, but that doesn't seem to help. I've tired downloading the library and placing in the x:\\libraries\IRremote but that has not helped either. Do you happen to know if there is any way of stopping the compiler attempting to use this RobotIRremote library (despite the fact I'm not including it anywhere in my code) and force it to use to the version in x:\\Arduino\libraries instead ? Richard, remove that robots folder from your libraries directory. I just moved mine up a level and renamed it with "-HOLD" on it in case I wanted it later. I'm using the duemilanove though. Hope this helps you. Thanks Wackychimp, that sorted the problem.... I can certainly live that solution, although would be nice if the Arduino IDE gave more control over library selections in cases like this... Thanks anyway! I have a philips TV remote. How can I control my TV with this?? Hi Ken, I am having a conflict with your library and an existing library in Arduino 1.6.5. The problem seems to be with a library called RobotIRRemote, which I think is a modified version of yours. The two don't play nicely together. How would you recommend proceeding? Arduino: 1.6.5 (Windows 8), Board: "Arduino Uno"
I am using a IR Safe Beam as source IR NOT wired to Arduino. I have captured signal with IR detector with your IRRecord code. I want to use the IR signal to control ON or OFF for motor on balancing machine for drive shafts. I think data suggests IR is pulsing off/on??? The raw data I captured is varchar? Or measured time as Int? I think , if I can get time OFF and time ON I can check for pattern change to control motor. Am I on the right track? Thanks for any suggestions. hi, i want to do aa project in arduino uno and i tried to work with 2 ir recievers with ur librery and it didnt work . can you please give me an advice or a code so i can work with 2 or 3 ir recievers ? just want to say thanks for so good written library. Works with any Arduino IDE-es version without glitches. I just wanted to say thanks, Ken. You've made what would normally be a long, painstaking process really simple. It took me only about 10 minutes to set up then record all of the codes from my 'HotPoint' air conditioner remote, so I can use it to control my robot car. It sends the code once, then a stream of 0xFFFFFFFF until the button is released and pressed again. Perfect. Thanks andvance for your help and sorry for my poor English!!! WOW, Thanks a lot for this library! record the codes from my FujiDenzo aircon and now I can control the aircon from my Arduino already! i compiled IRrecvDump whit older Arduino IDE and was all ok.
Arduino:1.6.7 (Windows 7), Scheda:"Arduino/Genuino Uno"
abilitato in "File > Impostazioni"
I used your libraries to identify the code sent by a remote control for a Kogan TV. The software detects the remote as a NEC and the codes have a size of 28 bits (for example Power On/Off is 0x2FD807F). However, when I send the same code to the TV, it does not react. I am not clear if it enough to send the code just one time or do I have to send some repeats or what else (I tried sending the code multiple times with various delays, sending 0xFFFFFFFF for repeats, etc). Is it possible that the software identifies the code incorrectly as NEC? Maybe there is something slightly different in the protocol? I used two Arduinos and when I send the codes from one board, the receiving board decodes the command as expected - however the TV does not respond. Just solved it. It is indeed NEC code. However, I was sending 28 bits (this is how many bits are in 0x2FD807F), I noticed that the software IRrecvDump indicated that 32 bits are received. So, I changed the number of bits to 32. On the other hand, I wonder why does the user have to specify the number of bits to send - wouldn't be easy enough for the software to count itself the number of bits? Tushar, you have to remove the folder\RobotIRremote from folder libraries, because the compiler uses the wrong library. If you want to keep that library, just move it to a different location. Have you been able to get this library to work using the Sparkfun emitter/detector pair (https://www.sparkfun.com/products/241)? Using the IRremote library, I'm able to detect and decode signals from my TV remote, stereo, and my kid's Lego train remote. However, I'm not able to then turn around and get the emitter to send the same thing so that the detector decodes it. I've set up two breadboards, one the emitter and one the detector. I can't command *any* code, using any protocol supported by the library, and get the detector to decode it. But I know the detector works because I can use the remote itself and properly decode the signal. I know the emitter is working because if I just drive the emitter (not a specific code), the detector sees something. But as soon as I try to drive a specific code, the "decode" function returns nothing. Both the receiver and the emitter work for me. I also had problems with the emitter - I was sending 28 bits initially, but when I used one of the decoder examples, I noticed that they interpret my tv remote as sending 32 bits, so after I change the code length to 32 in the emitter software, it started working. In order to be sure the circuit was set up correctly (the emitter pin), I installed a red led and was checking if it flashes while transmitting. I also noticed that I was able to control my tv with the red led from close proximity (a few cm). Also a white super-bright led worked for my tv. You have to pay attention to which pin is selected in code to transmit, then verify with a visible led that it flashes. Is it possible to make it work along with other libraries that uses Timer2? I have a problem sending the code. //Replace for your IR Code here. The original remote control is NEC code. Disassemble and inside has the NEC chip. Hello Every1. Found sumthng new reated to the same. Desmond Michael: Your website is plagarism. How to setup the arduino code to activate two led end one relay through ir remote with two button? first push of button1 activate led1 after some sec push button 2 then activate led2 end relay,after 30 sec automatically shut down two led-s but relay stey active,to shut down relay push button1 end button2 after 30 sec automatically shut down two led-s end relay. I've developed some improvements on it, so that the standard methods begin(), available() and read() can be used with IRrecv. Most important was a modification of the decoder selection, which now does not require any #defines or other modifications to the library. In begin() the user can specify the decoder to use, whereupon only that decoder is added to the program. This gives a considerable size and speed improvement to every program. Great Lib, thanks a million! With some modification, I was able to finally use the "IR input" of my NAD amp C352. It takes a 5V UNMODULATED "ir" signal, active high. For that, I modded your Interrupt Service Routine to output a HIGH on a dedicated ouput pin everytime the ir input state from the ir module changed to STATE_MARK, and a LOW everytime it changed to STATE_SPACE. And it worked!! And I'm a really bad programmer. IS THERE ANYTHING THAT I AM DOING WRONG?! I recently downloaded your library to try to operate an air conditioner. I had to change it because your library only supports 'Rawlen' of 100, resulting in 'overflow' reading the code on the remote control. By expanding 'Rawlen', it turned out that the library decodes only up to 32 bits, while the remote control sends a NEC 64-bit code. I had to change again the library to decode and send the code (only routines 'NEC') correctly. Therefore, I have a possible solution for those who have encountered the same problem. I see your library is 2009, so don't know if you keep on updating it. In case you're interested, I can send the modified code to the mail you indicate. Please excuse if in this forum someone else has already posted a similar solution to mine to solve the problem, because I have not bothered to read the 800 messages sent. Back I 2010, I posted the code I wrote to send Phillips RC5 extended commands. It turns out that code wasn't putting bit 7 of the command word in the right location! Here's a newer version. I have been struggling to Decode the Signal out of Samsung Air Conditioner Remote. The IRremote library doesn't seem to recognize the protocol. So I wrote a simple code using pulseIn() function of arduino to note down the time (in microseconds) for the HIGH and LOW states of the TSOP1738 data output pin. But I am unable to understand what does 17689, 8854 in pulseIn(...,HIGH) output and 2948 in pulseIn(..., LOW) output mean. I am not able to figure out the protocol Samsung is using to send the data. Also I tried to send this data as it is using an IR led but the Air Conditioner didn't recognize it. You faced same problem as me: Ken Shirriff library doesn't work for conditioned airs, because it's only able to decode 32 bits maximum. I've commented this limitation 2 posts earlier than yours. So i decided expand the library to admit any code length, and tested in both NEC and Samsung codes. I wrote to Ken offering it, but he doesn't answer. But if i can help somebody, i'll be happy doing it!. First, i saw your timings obtained by pulseIn() function are inaccurate. Are better using Shirriff interrupt's routines, so you don't need to modify them, just expand code to allow the 72 bits code of Samsung IR (64 of NEC). I did it creating an bool array, and filled with 1 or 0 upon decoding values. I think it's pretty explained. If you need more help, please ask for it! mephala: Please send improvements, bug reports, etc to the IRremote github repository: github.com/shirriff/Arduino-IRremote. There is some discussion of air conditioner support there. I'll try expanding the library as you said. I'll ask you if I need more help. Hi Ken, thanks for your Arduino-IRremote library but I got an error when compile examples IRrecord on board Genuino 101. It says "IRremote.cpp:21:27: fatal error: avr/interrupt.h: No such file or directory". How could I clear that. Is IRremote library working at Teensy 3.2 board? Must to modify code ? 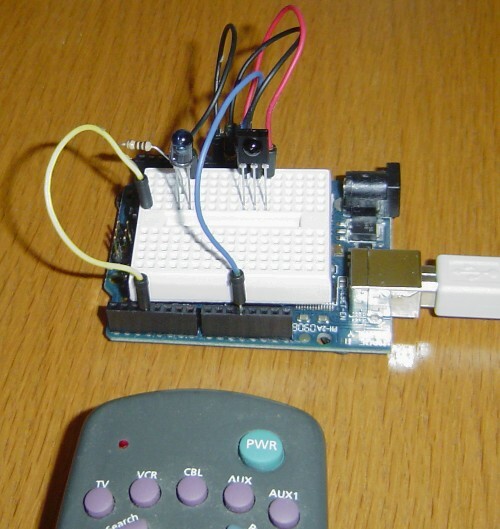 Is Infrared Remote Library working at arduino-stm32 ? Thank you very much. your job give a new life to my camera that was without a timed trigger. Electronic - It works fine. You are doing something wrong. Ken as far as I can tell there is no error checking in the IR data streams being transmitted. Do you know of any nice algorithms I could use for this please? i was trying to make a IR remote kind off, i am using NEC protocols, with your library and code i was able to send 1 single code only at a time, i want to have atleast 3 output signals at 3 different pins, so that i can have 3 different function performed by codes generated by each pin. could you help me with the program for this. My IRLed is working because i am able to control my TV with irrecord and irsend. i have to used IR library with dot matrix display My dot matrix display is updated every 1ms second by a interrupt if i use use IR library with dotmatix interrupt IR library give wrong value please tell me the solution for this. My friend David Riewe told me about your site. I've been having some fun learning about Arduino and have taken a few very, very basic online classes. So I am a newbie. I was wondering if it would be possible to come up with a POS system or basic cash register system with Arduino? Jason: It all depends on what features you want. Just a plain POS, yes. A fancy one with multiple graphic screens, probably not. Is it possible to define multiple PWM pins (as output) at once? In the example code is written which pin is defined as pwm output. How do i change this pin or add another pwm pin as output pin. Actually i want to detect IR raw code and same time it will send. So, i will confirm code.Whether it works or not. I did separate program but i could not use same time collect data and send as per collected data. So, help me for this problem solution. Hi, I would like some advice on creating a game buzzer setup using 8 Arduinos and a Raspberry Pi with only IR LEDs and Receivers. How could I create unique IR Codes for each buzzer and have the Pi identify them correctly? Thanks for producing this fine library. Very clearly written! I found it simple to hack the RC6 routine so that it can decode the Vista / Ortek VRC-1100 MCE Remote. This remote seems to send a simplifed version of the RC6. so the function code is 6 bits sort of in the middle, you have to reverse these bits. I may not be using this library for things as complex as all of the other people here, but I need to use this library for a project at school. I was wondering if there is any way I could use this to send and receive data between two Arduino boards, we did not make the boards, they were pre-made. The board is a NICTA ed1 board, just looking that up should get you the board. P.S. Responses ASAP would be great, my teacher doesn't even know this stuff and told me to ask online. Mostly I just want to thank you for your library here! **MUCH** appreciated. I've gotten what I needed working - the ability to send the mute to the TV here when the Dot LED ring turns on and unmute when the LED ring turns off. This was done for the same reason you did it, a friend with MS has a problem speaking loud enough to be heard over the TV, with this it should be easier for her as well as less frustrating. I have this on a Uno and am considering doing it on a Micro, not much used in the grand scheme of things for a Uno, but then again, there are possibly other things that could be implemented that would help Jean. At least I think it can be done on a Micro :). Again Sir, THANKS FOR YOUR EFFORTS!!!!!!!!!!!! Thanks a lot for your contribution to the Arduino world. I found that two of my controllers were not properly detected, after reading some posts and Ken's answer, I was able to properly capture the codes by increasing the RAWBUF to 256 in IRremote.h, and also the _GAP to 15000 in IRremoteInt.h. Analyzing the codes, I noticed the total count of marks and spaces was 199 for one controller, and in the second controller there were spaces with a count of 9400, and the pattern was repeated after this long space. Hope this help some of you facing same problems. Hi, i'm having problems to decode the air conditioner "komeco"(https://http2.mlstatic.com/controle-ar-condicionado-komeco-zhkz-01-original-pilhas-D_NQ_NP_927325-MLB25426377746_032017-F.jpg). every time i tried to take the code, i got a different code, and don't work. In reply to simonjtaylor212: "Be wary of laptop IR!" I have troubles with reading serial input from a digital temperature-sensor every time I start IR by irrecv.enableIRIn(). The sensor doesn't have to send data more often than maybe every minute so the easyest way to get rid of this effect would be to disable IR during the measurements (which only take milliseconds). Is it possible to disable IRIn? I searched a lot of examples and documents but couldn't find any command like disableIRIn() or something like that. Dieter: There's currently no support for disabling the interrupts. You could look at enableIRIn() in irRecv.cpp, and make a disableIRIn() function that undoes these things. (Probably TIMER_DISABLE_INTR is all you need.) Alternatively, you could open an issue on the github and someone might implement it. thank you very much for the really quick response! Due to the fact that the code doesn't have to be efficient or react quickly it seems to be enough to disable timer counter 2 in main loop and re-enable it after conversion. At least for testing it's fine, I will search for a more suffisticated solution later. how can i control my AC any one help would be appreciated. I've been given this info for a device. I'm trying to get it to work but i am a beginner with arduino and have absolutely no idea where I'm going wrong is there any chance someone on here might be able to wright a basic script for me to help me understand it a bit better? |"To enter this mode a 3 sequence RC5 IR command must be sent within 1.5secs of first command to last command. Note – the field bit is used to give 7bit command code. See Philips RC5 protocol spec. " How to fix interrupt error? Hi all , r there any youtube video about this specific experiment ...I mean one step learning remote controls ?!!! Hi, I've been looking for a long time and I've been working too hard trying to get the IR codes from my split type air conditioner remote control without success. It brand is Parker and I can't get that codes because no one sketch can decode them, therefore recently I got a sketch it could get some codes but, they are repeated in most of the buttons of the remote. So, if you can give me your e-mail, I could send to you some pictures of the remote and arduino serial monitor screenshots. How can get the raw codes to convert them to any useful codes in order to control my appliance from arduino?. I hope you can help me and I'll be really grateful about that. Hello! Thank you so much for your help. IRemote lib doesnt work for me but your code does but I have problem sending my codes. I tried using your receive code and it works fine with my 48 bit remote. Problem is I cant send the codes back. How do I send the pulses with 50% duty cycle 38Khz signals? Hey, absolute noob here, are there any detailed instructions on assembling this? Gostaria de saber se é possível adicionar mais um LED infravermelho em uma porta PWM, para que possa gerenciar dois ar-condicionado simultaneamente. hi I am using Arduino ide for programming and completed many projects in Arduino it also includes Infrared. Now I am migrated to stm32F103c8 using Arduino ide then I want to use this infrared Arduino library for STM32 but its not working and returns error what changes in the library may I use to work with STM32 ?? Thank you for the info. Question: I have a remote for my Pentax Camera. Pentax protocol is a 13ms burst, a 3ms pause, then 7 burst cycles of 1ms on and 1 ms off. It is at a frequency of 38Khz and 50% duty cycle. Using your library and the Arduino, it show a code of 8DCDAE60 for the shutter. Looking at the signal of an AX-1838-HS sensor, and the raw of the remote on an Oscilloscope, it matches the protocol above. Where does the code come from? This has been driving me nuts for a month or two. All my other remotes, the signal on the Scope decodes to what the Arduino sees.